founded and led by veteran Japanese American theater artist Ako. literally meaning “that which illuminates”, and ZA means “theater”. 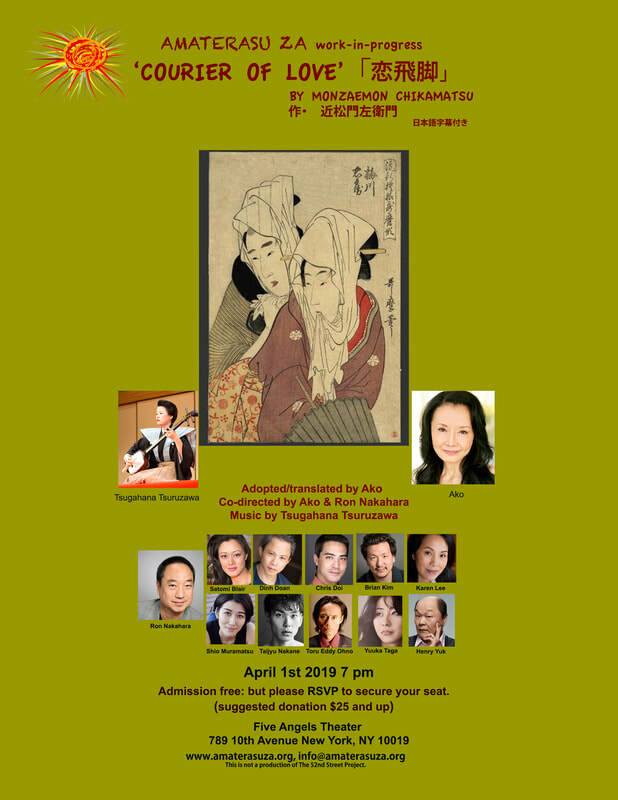 of the classic Japanese play 'Courier of Love' by Chikamatsu Monzaemon. Born in 1653, Chikamatsu is considered the greatest Japanese dramatist of all time and is called the Shakespeare of Japan. to raise $10K ​in support of the company by December 31! 'Courier of Love -work in progress'! MAKE A TAX-DEDUCTIBLE CONTRIBUTION VIA DONORBOX!!! Amaterasu Za, Inc. is a tax-exempt non-profit corporation organized under section 501(c)(3) of the Internal Revenue Code. ​Accordingly, all contributions to the Amaterasu Za are tax-deductible to the fullest extent of the law.